All transactions are safe and secure with a reliable history in online purchasing behind each of our associates. Buy the Hitting Queens Boulevard t-shirt to own Entourage clothing and merchandise. 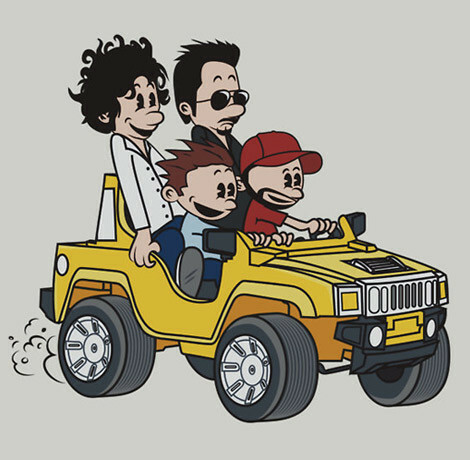 The front of this tee displays an Entourage TV show design inspired by the Calvin and Hobbes comic strip. Here, the gang, including E (Kevin Connolly), Vince (Adrian Grenier), Turtle (Jerry Ferrara) and Johnny Drama (Kevin Dillon), is hitting Queens Boulevard in Turtle's Hummer. This Entourage t-shirt will grab the attention of your friends, who will want to be part of your high rolling crew. Just be careful of posers who only want to be your friend because you are famous. In addition to the Hitting Queens Boulevard tee above, browse the Entourage Clothing Gallery for more apparel like men's and women's clothes, kids shirts or hoodies.